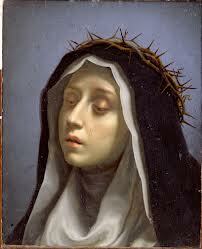 Catherine of Siena was born in Siena in 1347 and was the 23rd child of her parents, Giacomo and Lapa Benincasa. Much to her mother’s dismay, she spent much of her time in prayer and meditation. Since Catherine was such a beautiful woman, her mother encouraged her to take better care of herself so she could marry well. Catherine rebelled against her mother by chopping of all of her hair. When she was 21 years old, she entered the Third Order of St. Dominic. During her three years there, she fasted, prayed and mortified her flesh. The term “mortifying flesh” sounds more severe than it really is. It is an act of sanctity and method of penance of sins. To mortify one’s flesh can be done by fasting, walking barefoot, pious kneeling or lying face down on the floor. During her three years in the Order, she had a vision of a marriage to Christ and, in this vision, He instructed her to undertake charity work. After this vision she decided to live her life in devotion to helping the poor and the sick. Throughout her life, she continued to have visions of Christ. One remarkable vision she had was of the Crucifixion of Christ. In this vision, Catherine could physically feel the nails driven into the hands and feet of Jesus Christ. Towards the last few years of her life, Catherine became an advocate in public affairs for the Roman Catholic Church. She is mainly known for her ability to persuade Pope Gregory XI to move the papal back to Rome. However, Pope Gregory passed away shortly after and the new pope, Urban VI, led to the schism in the Western Church. 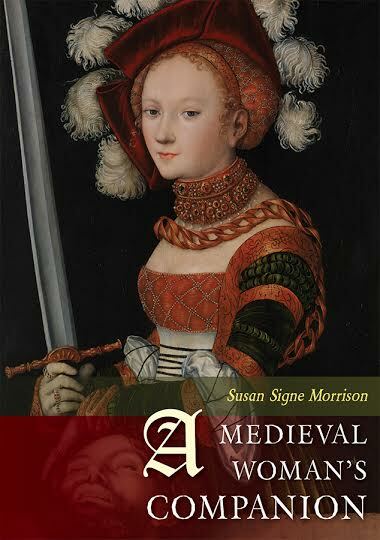 She passed away in 1380. Catherine has many works, poems, and letters containing her beliefs and experiences. She was canonized in 1461 and is known as one of the many patron saints of Italy. Her feast day is celebrated on April 30th. Catherine died April 29, 1380. She was 33 years old. Catherine was canonized into sainthood July 1461 by Pope Pius II. She was proclaimed Doctor of the Church October 4, 1970. Fifty years or so after she died, Catherine was body was uncovered and it was incorruptible. An incorruptible body is seen as a miracle in the Roman Catholic Church. The body is miraculously preserved after death and it defies the process of decomposition. The bodies are nothing mummy-like. They are soft and the joints are pliable and the bodies often give off a sweet smell. In addition, some of the blood or oils the bodies give off have not been able to be explained by scientific research. Thus, a miracle. If a body is discovered to be in this state, sainthood for the person passed away becomes a possibility. Many of these bodies can be found under the altars of the Vatican. Hangings and decapitations were commonplace for capital punishment in medieval Italy. It was done to deter anyone else observing the execution to perform any further crimes. However, Catherine took it upon herself to accompany one prisoner to his scaffold and be with him in his last hours of life. Her presence at his execution was also common as to provide a sense of comfort to the men before their deaths. This story was told in one of Catherine’s most startling letters to her friend Raymond of Capua. In this letter she tells of her experience with the prisoner and her intentions, which caused some controversy. It is said that the prisoner, Niccolo di Toldo, and he refused company from anyone in the religious order before his death. However, Catherine offered her services. Niccolo did not wish to make penance, receive last rights or the Holy Communion. However, Catherine was able to persuade him to do so and accompanied him to his last Church service where he took the Holy Communion, something he had not done in several years. She notes that after the mass, Niccolo felt so comfortable with Catherine that he confessed his sins to her and even laid his head against her breast from the comfort she brought him. She kept him company and walked with him to his public execution. Niccolo was to be decapitated. Once the execution was carried out, Catherine caught Niccolo’s head in her hands. At the age of six, St. Catherine had her first vision of Christ and thereafter, she dedicated her life to him making promises of chastity, penance and good works. One of the reasons behind her title, “Doctor of the Church,” was because she cared for the sick with diseases such as the bubonic plague, also known as The Black Death. 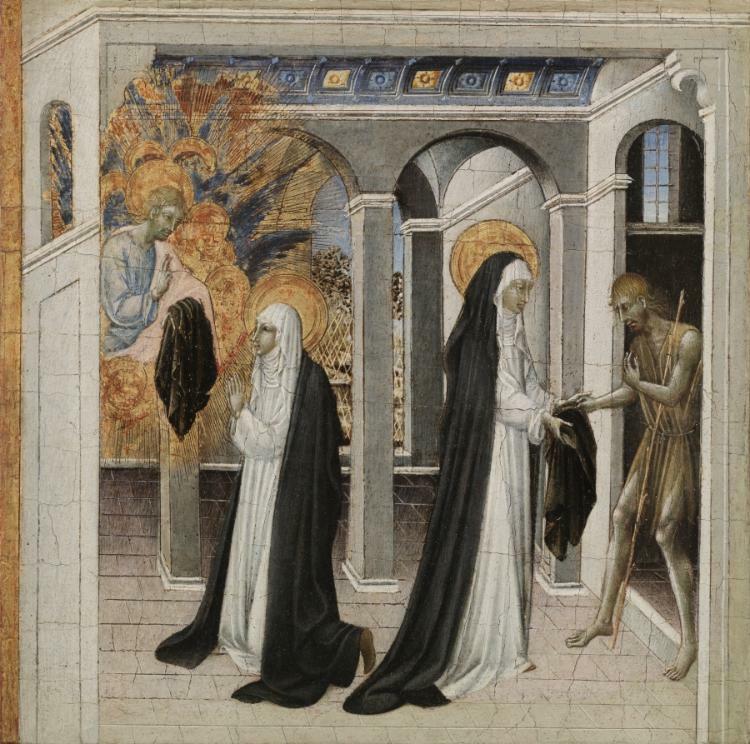 The story of one of the visions Catherine had: Catherine was praying at an altar in Siena choosing which of the Dominican garments from St. Francis, Dominic and Augustine she wished to wear. These mentioned saints were all founders of religious orders. After Catherine chose a garment she gave it to a beggar in need of it who appeared to her. Catherine gave her new garments to the beggar who was actually disguised as Christ. Because of her charity, Christ returned the garment to her and it always kept its wearer warm after her display of charity. 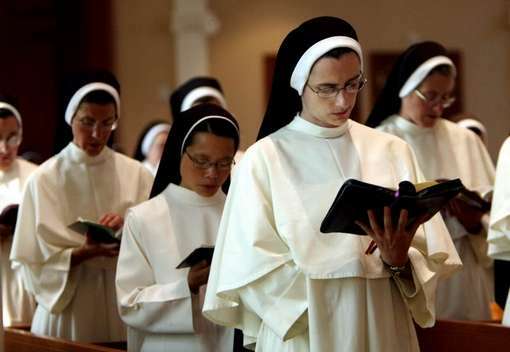 The habit of the Dominican Order is a symbol religious leaders wear to symbolize their life’s devotion to Christ. The garments are black and white which represent the simplicity of their lives and devotion to penance and innocence. 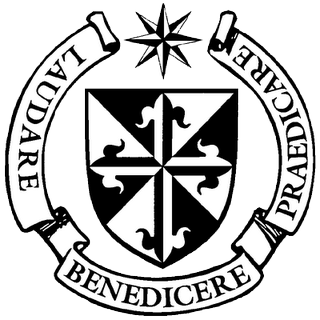 When Catherine accepted the Dominican habit, it was a symbol of her accepting her joining the Order, which is still a respected symbolism and ceremony among those of the Order today. The garments are also seen, for the women, as a gown, to be Brides of Christ. They wear a white robe with a black veil. Above is a look into the ceremony of Dominican Preachers accepting their habits, an exciting day for them. 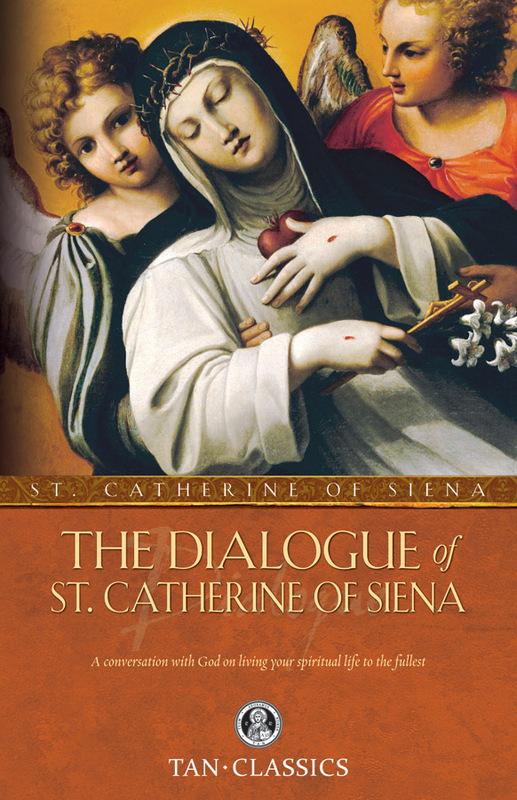 The Dialogue of St. Catherine of Siena was written while she was in a state of ecstasy. She claims to have written this while in dialogue with God, so this count is a record between the Eternal Father and a human soul. Through Catherine, the Eternal Father emphasizes the need for continual prayer, obedience and cultivating virtue. What Catherine writes is still in practice today and can benefit anyone who reads it. 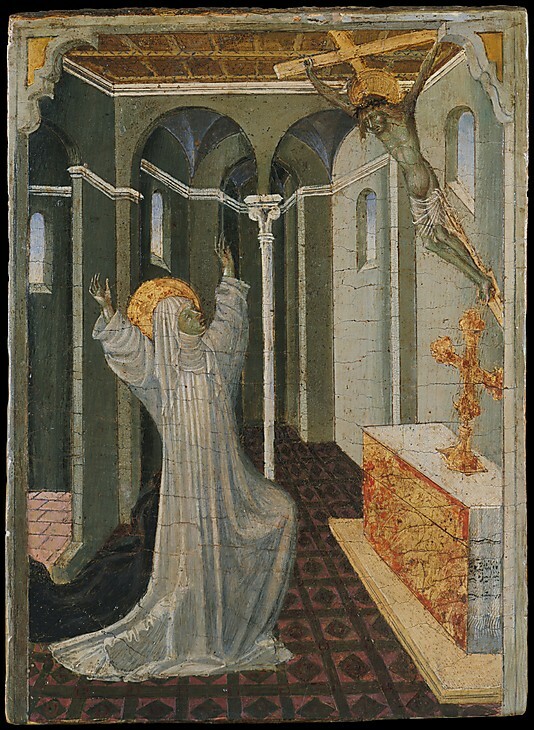 St. Catherine of Siena received the stigmata, which are the same marks of the wounds Jesus Christ received when he was crucified. There are two kinds of stigmata, the visible and the mystical. 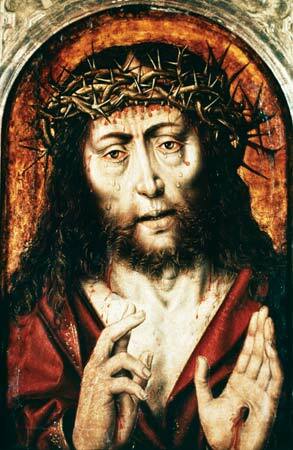 The visible stigmata includes the wounds Christ received (two in the hands, two in the feet, one of the right side of the torso, the crown of thorns) and those receiving the stigmata feel the same pain Christ felt during his crucifixion. The mystical, or invisible, stigmata include only the pain and no marks can be seen on one’s body. Catherine at first received the visible stigmata; however, through her humility, she prayed that the marks be made invisible. Her prayers were answered and the marks were not made visible again until her death. It is said that Catherine received these marks while meditating and praying at the Church of St. Christina in Pisa. While she was praying, she gazed at the cross and blood-red rays of light pierced her with the marks of the stigmata. Catherine was an advocate to bring the papal back to Rome and she worked with Pope Gregory XI, whom she was able to persuade. However, when the Pope died and another was elected, Pope Urban VI, complicated political and religious issues flared. As a result, “antipopes” rose, who were still religious cardinals; they were just in heavy debate with the current pope and expressed different points of view for the Church. There were two antipopes in Pisa and two in Avignon. These antipopes experienced political turmoil years before, about 70 years. The election of Urban VI caused an uproar and revitalized their differences. The site below provides more information about the Western Schism. Barrett, J., & Lukowski, A. A. (2008). “Wedded to Light: The Life, Letters, and Legend of St. Catherine of Siena”. The Journal Of The Midwest Modern Language Association, (1), 1. Giovanni di, P. (n.d). St. Catherine of Siena and the Beggar. HOOK, J. (1980). “St Catherine of Siena.” History Today, 3028-32. Morrison, M. G. (2013). “St. Catherine of Siena and the Spectacle of Public Execution.” Logos: A Journal Of Catholic Thought And Culture, (3), 43. Parsons, S. F. (2003). “St Catherine of Siena’s Theology of Eucharist.” Heythrop Journal, 44(4), 456.